Councilor Althea Garrison noted that the state banned rent control in 1994 but said the city is in far worse times. The emerging debate over rent control appears to have quickly pitted the City Council’s old guard against its newest members. 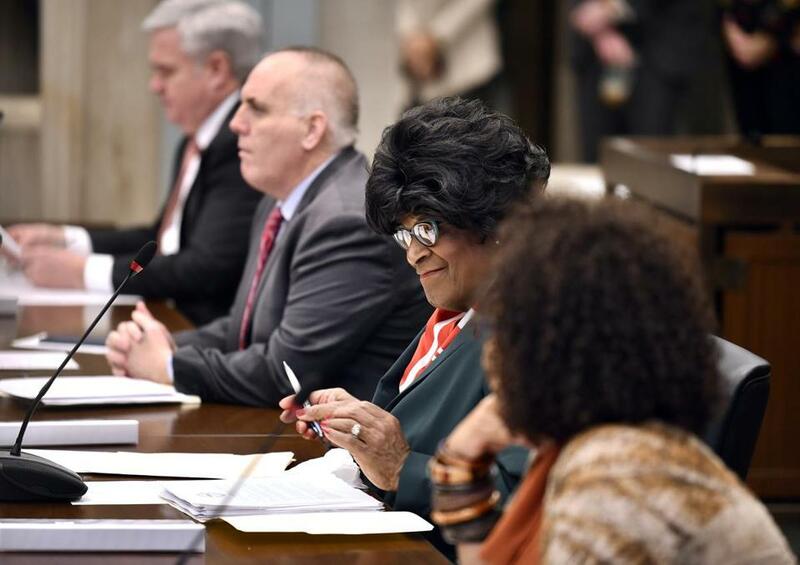 The line was drawn Wednesday when Councilor Althea Garrison, who took the seat that Ayanna Pressley left in January following her election to Congress, proposed an ordinance that would allow Boston to cap yearly rent increases in residential homes. The measure is meant to help combat the displacement of renters by landlords who are boosting rents in a booming real estate market. It would need to be approved at the state level in the form of a home-rule petition, but the Legislature is already debating rent control at the state level. Garrison noted that the state banned rent control in 1994 but said the city is in far worse times. Typically, a request for an ordinance is introduced with a quick speech and referred to a committee hearing for a full-fledged debate. But at last week’s meeting, councilors were quick to weigh in on the debate over rent control. Councilor Timothy McCarthy, who holds the District 5 seat that stretches from Hyde Park to Mattapan, called rent control a “horrible failure” of the past that stunted the real estate market and dissuaded landlords from investment in their homes. “My feeling is it will continue to be a failure,” said McCarthy, who was elected in 2013 and is stepping down at the end of this year. Councilor Frank Baker, whose District 3 seat stretches from Dorchester to the South End, also said he would oppose the ordinance, recalling a time, he said, that Boston neighborhoods had fallen apart because landlords couldn’t afford the upkeep of their properties. He noted that 70 percent of Boston’s yearly budget depends on property tax revenue. Baker said the conditions of Boston’s neighborhoods have improved, but “you’ll see those things start to chip away” under rent control. She noted that 65 percent of Boston’s residents are renters. Landlords, meanwhile, “they own here, but they don’t live here,” she said. Councilor Kim Janey, who represents Roxbury and also called for the discussion, said the issue of rent control was at the center of a community hearing she held to discuss gentrification in Roxbury in November. “We need to be looking at all the tools in the toolbox, this being one of them,” said Janey, who was elected in 2017. Councilor Mark Ciommo, from Allston and Brighton and who was elected in 2007, added, though, that he opposed rent control, calling it a burden on small landlords. Ciommo acknowledged, “We can all do better.” But, he noted that Boston already has the highest percentage of deed-restricted property in the United States and said the city’s surrounding communities need to do more to help confront a housing crisis. The discussion might all be for naught, anyway: Mayor Martin J. Walsh has said he does not support rent control.